Are you in constant search for the perfect website theme for your online magazine or newspaper? The perfect website template for this purpose needs to be powerful and organized enough to showcase a lot of content but it should also have a modern design that will keep the visitors longer on the platform and even attract new views. We know how hard it is to find the perfect template that has all the necessary features but also a great, eye-catching design. 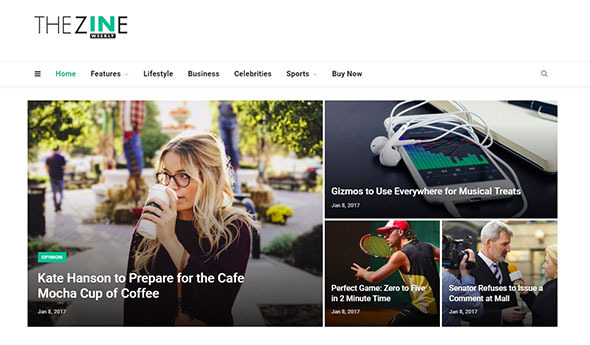 That’s why we put together a list of 25 of our favorite WordPress magazine themes that we’re sure will work great for any magazine, newspaper, review website or even blog. These themes have everything you are looking for and they will help you achieve the perfect result in a very fast and easy way. Just see for yourself! If you’re looking for a modern and minimal WordPress theme for your online magazine or blog, then Grand Magazine can be a great option for you. This theme has a fully responsive layout, while also being mobile-friendly. This awesome theme also gives you the possibility to add a ‘Hot & Trending’ section of your website more exciting for your visitors. You can also choose from lots of different color variations, blog and post styles and more! Motive Magazine is another great example of a cool and modern theme that you can use for your online magazine, regardless of the subject or style. Motive Magazine was created with SEO Optimization in mind and a fully responsive layout. This theme also comes with ‘Motive News’ – a skin created especially for news sites and online newspapers. You’ll see that it’s very easy to create and customize your website thanks to the Page Builder – a very user-friendly and flexible tool. 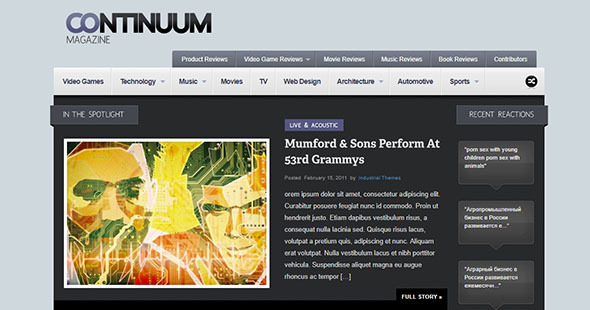 MagPlus is a really powerful WordPress theme that will work great for magazines, blogs, news, review websites and more! It comes packed with lots of useful features that will help you create the perfect website for you. This theme comes with lots of awesome features such as more than 160 elements and modules that you can use and customize, 6 premium plugins that you’ll get for free when you purchase this theme, WooCommerce integration, unlimited layouts and more! 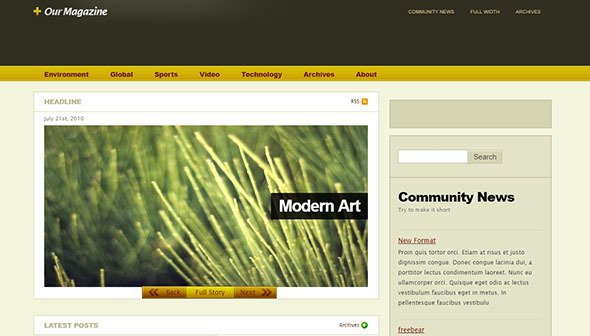 Venus is a very clean and user-friendly WordPress theme created with magazines in mind. It has all the features you may need when creating a stunning website for your online magazine. Venus has a fully responsive layout that can be easily customized using the Drag & Drop Content Builder. You can also add a responsive AJAX search, a Breaking News section and lots of other fully customizable elements! Publisher is another great example of a complex but easy to use website theme created for newspapers and magazines. ‘Publisher’ comes with a user-friendly interface and lots of features that you can customize as you please. You can even use this theme for personal blogs if you want a professional look. One of the best thing about this item is that it comes with an advanced Ads Management system that will help you monetize your website if you want to. Here we have Newsmag – a very modern and powerful WordPress theme that will allow you to write articles and publish them on an awesome online platform in no time! We recommend this template for newspapers, news websites, review websites and even personal blogs. This theme also supports Youtube videos and it lets you implement a rating system that your visitors can use. Newsmag also supports Google Ads and Adsense if you’re planning to create an online platform that will create income for you. 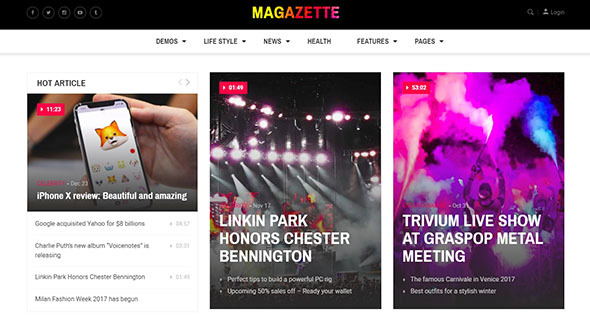 Magazette is fully responsive WordPress theme that can be used for countless purposes and websites. You can use it for your online magazine, news website, newspapers and blogs. This WordPress theme will bring you high ranks in Google and reduce the bounce rate. You can create your website in minutes just by using the Drag & Drop option. Magazette is the perfect template for many niches such as travel, food, fashion, education, lifestyle, portfolio, business, photography and more! If you still haven’t found what you’re looking for, then we recommend MiniMag – a very modern and powerful WordPress theme for blogs and online magazines. It will be very easy to install and customize your website if you use the one-click demo setup that’s both fast and user-friendly. MiniMag has a fully responsive layout based on the powerful Bootstrap 4.x framework and it was created with SEO Optimization in mind. We recommend Daynight Magazine because it’s a very clean and modern-looking WordPress theme created for newspapers and online magazines. This template offers great SEO Optimization, awesome typography options, Google AdSense placement and more! It’s very easy to build your website using Daynight Magazine and it comes with so many powerful features that we’re sure you won’t need anything else to fulfill your needs! Ratency is the perfect choice if you’re planning to create an awesome website for your online magazine or even review website. The Drag & Drop Page Builder is a very fast and simple solution for creating your website and moving elements around and the Premium Slider is a very powerful tool that will help you create stunning sliders that will make your visitors come back for more. You can also choose from unlimited colors and fonts! The Voux is a modern and carefully designed website theme that’s perfect for online magazines. You can choose from different homepage designs and change everything you want by using the powerful Visual Composer that comes with your purchase. The Voux has a fully responsive layout and it’s very easy to install and customize it in order to create the perfect website for you and your business. Harborne is another great example of a professional WordPress theme that will help you create a stunning online platform for your magazine, news website, editorial or even blog. This theme has a fully responsive design that’s both efficient and user-friendly. You can choose from unlimited color schemes, lots of free Google Fonts, custom widgets and more! You can even add tiled galleries into your posts and articles in order to make everything eye-catching! NewsTube is one of the best choices if you want to create a stunning and well-organized website for your magazine, blog or even video website. NewsTube comes packed with lots of useful features and extensive Theme Options that will allow you to edit and customize everything you want. You can add lots of video features such as video channels, playlists, video ads and more! Here we have Mazada, a premium WordPress theme that will help you create a professional website for your newspaper, online magazine or review website. Mazada comes with very fast loading speeds and a mobile-friendly and SEO Optimized design. You can also use the very useful shortcodes that come with Mazada if you want to take your website design to a whole new level. 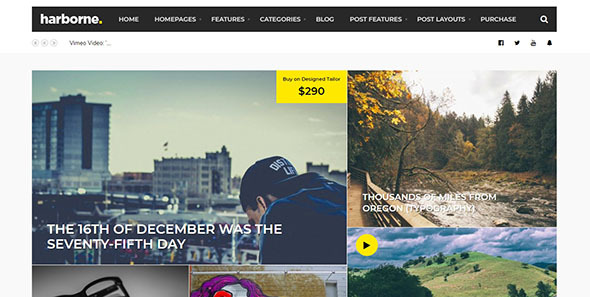 NYOOZ is a great choice for a WordPress theme created especially for magazines. NYOOZ comes with a fully responsive design, lots of homepage designs, lots of demos and shortcodes, unlimited colors and everything else you might need when creating your website. This theme also comes with MailChimp support and lots of widgets that you can use in order to enhance the aspect and utility of your website. Design trends are constantly changing and it’s critical to adapt at the drop of a hat; stay ahead of the game with Hickory, an incredibly customizable magazine & blog theme designed to meet your every need. Hickory’s clean and highly adaptable form was specifically crafted to appeal to every niche and comes chock-full of premium features. Whatever your magazine or blog needs, Hickory is here to deliver! If you’re looking for a fully functional and attractive website template for your online magazine or newspaper, then GDN Magazine may be the perfect solution for you. You can choose from different widths and elements that you can customize and move around. One of the best features of this theme is the built-in ‘Submit Message/Video’ feature that will help your users interact with your platform. GDN Magazine comes with strong SEO Optimization, lots of fonts, the stunning JaW GalleryBeautify and more! Boal is a powerful website template that comes with lots of useful features and an eye-catching design. It’s perfect for online magazines, newspapers, personal blogs, publishing or review websites – the possibilities are endless. This theme will also allow you to create and add stunning headers to your website and the Visual Page Builder will help you easily customize everything and achieve the perfect result. If you want to create the perfect website for your magazine or newspaper but don’t have a lot of time for this, then Continuum can help you achieve this very fast and easy. Continuum is a powerful WordPress theme that comes with more than 200 customization options and it’s so versatile that you can use it for different other purposes too. Continuum also comes with the awesome Feed Framework which will group and display your posts in a smart way. Here we have Our Magazine, a perfect solution for a modern and fully-responsive magazine website. This theme comes with 2 different color skins that you can choose from. It also has a special slider dedicated to headline news that will catch your visitor’s attention and many advanced theme options that will help you customize and change anything you may need. Bimber is the perfect choice if you want to create a website, especially for viral news and articles. It will take you less than 24 hours to have your website done and we’re sure this theme will come with everything you will need when customizing it. Bimber is optimized for viral content and it will allow you to add specific badges, create interesting lists and even add fake shares, page views, votes, reactions and more! Femme is an elegant and modern WordPress theme created with fashion bloggers and magazines in mind. Femme is very easy to install and customize and it comes with lots of specific features for this niche. Femme is also compatible with WooCommerce and the one-click demo install will help you get your website ready to go in no time! SimpleMag is another great example of a professional website template that will help you achieve creative results. We recommend it for online magazine and newspapers and it comes with a fully responsive layout and unlimited color schemes. SimpleMag is also SEO Optimized and it comes packed with lots of powerful features that will help you create the perfect result. If you still haven’t found the perfect website theme for your magazine and news website, then you can take a look at Afario. Afario is the perfect choice regardless of your magazine’s niche and it can be perfect for fashion, travel, sport, entertainment, technology magazines and more! This theme comes packed with lots of features and elements that you can choose from in order to create a fully responsive and mobile-friendly website for your visitors! 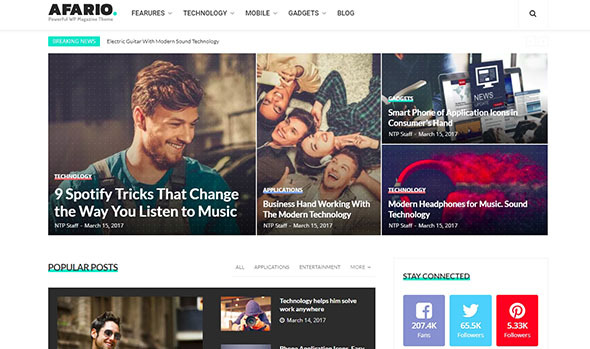 SmartMag is a very clean and fully responsive WordPress template created with online magazine and newspapers in mind. You can create your website in minutes using the Drag & Drop function. SmartMag also has WooCommerce integration, lots of layouts and skins that you can choose from, Google AdSense support, a very powerful Admin Panel and more!